It’s getting perilously close to the Cambridge FCE, CAE and CPE exams here in Barcelona. If your preparation courses, like mine, are finishing a week or so before the exam itself – or even if that dreaded date is still some way off – you’ll want to give your students the tools and resources to continue preparing themselves independently. Here are some ideas to help prepare for certain parts of the Use of English and Reading tests, utilising a couple of very handy websites that most students should be able to use after a bit of demonstration, trial and error. Let’s set aside, for now, the perversity of the title of this cherished stalwart of the Cambridge testing armoury. I’m sure your students are already aware of the type of language required to fill the gaps in a typical open cloze (grammatical words and linkers, give or take a hot verb or two). But when they’re practising this on their own and get a gap wrong, they’ll want and need to get their heads around why they were wrong, as well as gain some insights into why the correct choice is, well, correct. This activity should help increase your students’ repertoire of responses when it comes to the real thing. The website www.wordandphrase.info is a *fairly* straightforward concordance tool which allows the analysis of chunks or entire passages of text. (If you want an easier ride, I’d jump to the suggested activities in part 2.) To use this site more than a few times you’ll need to log in, but that’s all free and easy to set up. For demonstration purposes I’m showing my First Cert students an analysis of one of the tests on Flo-Joe, as this permits us to copy and paste from the website. Students working from paper tests at home won’t have to type in the whole test by hand, only those chunks of text they want to have a closer look at. First, get the students to do the test and peer-check their answers. Feedback as usual but take note of any problematic points. Tell the students they’re going to find out how to get more information about these problematic gaps by using the internet. Once pasted, you can edit the text in the top left panel in any way. I have replaced the gaps in the text with asterisks. Once happy, select ‘Phrase’ and click ‘Search’. 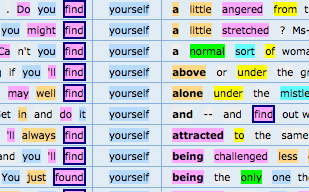 Your text appears in the right panel with the words colour-coded to represent their frequency. In the exam, calm _______ down by breathing deeply. After clicking “search” we get a list of combinations, which contains both ‘you’ and ‘yourself’, down in the bottom left panel. 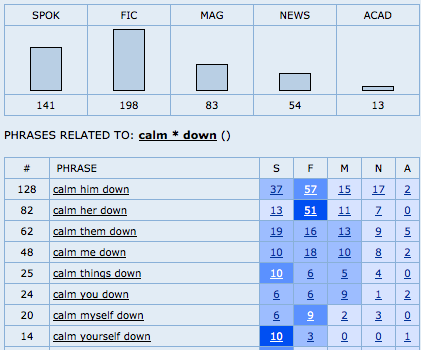 This little comparison shows how an external thing, ‘it’ or a ‘photo of your puppy’, is needed to calm you down, whereas ‘you’ is always the subject of ‘calm yourself down’. In our case we related this to the Spanish/Catalan reflexive verbs, which can sometimes be translated by use of the reflexive pronouns myself, yourself, himself, herself, itself, ourselves, yourselves, themselves. Students might notice how we often find ourselves “past participled” in an emotive way, e.g. angered / attracted, or find ourselves alone or the only one; scrolling down further, they’ll find ‘in’ used with a lot of frequency: you might find yourself in disagreement with someone, in trouble, in Poughkeepsie etc. And so it continues. Look at further examples as they come up, or even better, if there are enough computers available, get the students to try it for themselves. It’ll take a little time, and some guidance on how to focus on the most frequent patterns. Above all, you’ll need to test it out beforehand, although it should be said that some of my students were able to teach me how to use it better after only a couple of attempts. Less computer-literate, or indeed linguistically aware learners (and teachers) will obviously need more time with it. A phrase search for about * everyone (don’t forget to select the asterisk and convert to ‘any word’) reveals ‘what’ and ‘how’ as the most frequent fits, which both seem to work, and you could go on to highlight uses of interrogatives in structures like this. However, a search for * you want to reveals a number of linkers and other words, none of which are immediately obvious without returning to the text and reading the passage more extensively. Unless is the answer here because of the negative imperative ‘Don’t join’, and this is somewhat beyond the scope of the tool (or me, more likely) to highlight. In any case, it presents an excuse to remind students of the danger of focusing only on the words immediately around the gap. This test, part of Use of English and Reading in the various Cambridge exams, can leave students with that awful feeling of stabbing in the dark. Again, to help their review of practice tests outside of class, we can direct them to another very useful webpage to tease out differences in meaning. 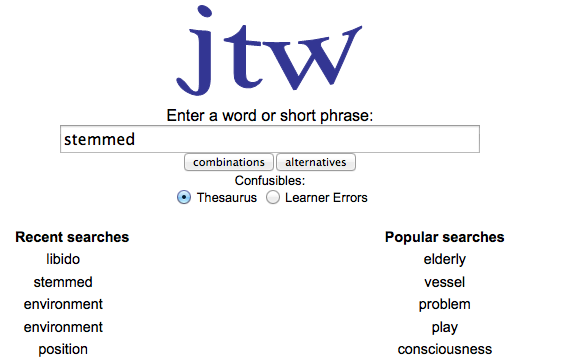 While this site is definitely easier to use thanWord and Phrase, a few things need pointed out. It’s not a dictionary. We’re beginning from the premise that all four of the words from the example above are roughly synonymous with “began” or “started”. It searches for all forms of the word and you need to think about what word-form and combination of word forms you are looking at for it to make sense. 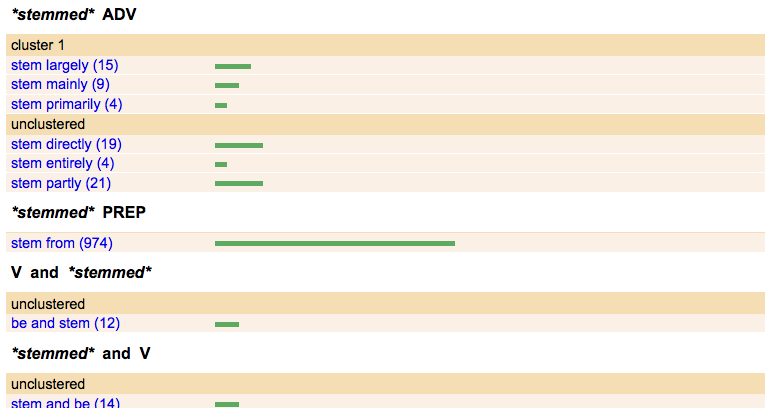 Additionally, it only displays the words in base form – you have to click on each one to see specific examples. Combinations in the list might be clustered (together) or unclustered (in close proximity). Pay attention to the green lines on the right – the longer the line, the more frequent the collocation. The long green line indicates that stem from is a highly frequent pattern. Click on it and we can see some examples. Students at this level shouldn’t take long to latch onto the meaning here – stem from is used when something originates from something else. We might go on to point out (these are CPE students after all) that the word is being used metaphorically – stem relates to organic structures – and that by following the stem of something we might find the root or origin. Initiated: The discussion was ______________ by the chairman. ‘Discussion’ is a frequent collocate of initiate, as is ‘by’; initiated is therefore often used passively. Commenced: The proceedings _______________ five minutes after the dinner had ended. The race will have _____________ in half an hour’s time. They saw that proceedings often commence in an active way, and that in is a frequent following preposition. Instigated: The reforms were ____________ by the Treasury. This pattern was noticed by clicking on the passive structure instigated by. I finally asked the students, for homework, to research the other more challenging options in that particular exam and create gapfills to test their classmates in the next lesson. This they did, with useful results. All felt they had deepened their knowledge of use of vocabulary, collocations, dependent prepositions and fixed phrases. 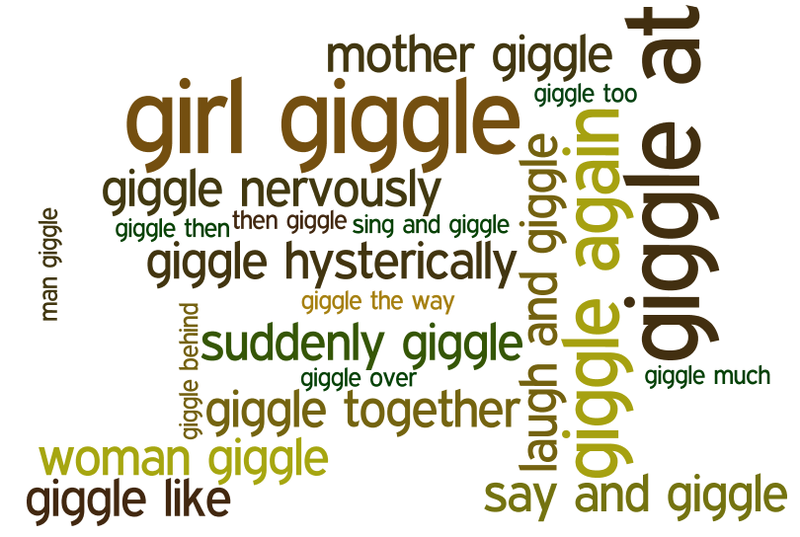 We got some interesting insights into the precise reference of, for example, chuckle, giggle and snigger. Which one is more often associated with women? Which one might be ‘soft’? Which are ‘devious’ or ‘hysterical’? The icing on the cake, as you can see, comes with the facility on this page to create Wordle word-clouds from the patterns you are researching. If you haven’t seen these before, they represent the varying frequency of words and phrases through varying sizes of text. Just click on the “View in Wordle” link in the top left corner of the just-the-word search results page – you may need to allow pop-ups, install Java and click some permissions to get it working. It’s been suggested by Nik Peachey (thanks Nik for putting me on to Just the Word in the first place) that these word-clouds could be used in conjunction with gapfills. I’d also recommend that students save, print and use them as visual cues to review vocabulary that they sometimes struggle to use correctly. One of my advanced students frequently uses ‘I consider’ where ‘I think’ would do better (it’s a false friend), and I was able to print out the following to show him which things are ‘considered’ in English. Tip: click “randomise” on the wordle page until you get a pleasing cloud. You can select the colours to optimise the image for printing. Another student asked me if ‘bloody’ was always used negatively in English. ‘Bloody good question’, I was able to reply. It’s fairly obvious that these tools have applications well beyond exam preparation. They could help any student (and teacher) become a more independent language researcher/learner. If you have any other ideas for how these websites could be used, or can let us know of other, similar tools, we’d love to hear about them. I’ve tested the wordandphrase.info a bit more with my FCE students and would conclude that it takes more work than the second option. I’m not saying it’s not worth it, it’s just there are more variables to fiddle with (e.g. you can search for particular parts of speech, or any form of the word, to obtain more generalised results). It might not be for everyone but with perserverance could prove very useful. I’m completely sold on just-the-word, I think it’s great, and my Ss seem to find it useful too.